Little Dragon is an electronic music band, based in Gothenburg, Sweden. It consists of Swedish-Japanese singer Yukimi Nagano (vocals, percussion) and her close high-school friends Erik Bodin (drums), Fredrick Källgren (bass), and Håkan Wirenstrand (keyboards). The first Little Dragon's release was a double A-side 7" single "Twice"/"Test", released on Off The Wall label in 2006. 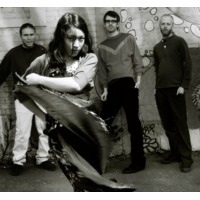 The following year, the band signed with the larger British indie Peacefrog Records and released their debut self-titled album Little Dragon on September 3, 2007. Since then they have been touring through Europe and also have made music videos for the songs "Test", "Twice", "Constant Surprises", "After the Rain" and "Fortune". The double A-side single "Fortune"/"Blinking Pigs" was released in the UK on January 26, 2009. Their song "Twice" is featured in Season 5 of ABC's Grey's Anatomy. In late 2009, the group was chosen as one of Beyond Race Magazine's "50 Emerging Artists", resulting in a spot in the publication's #11 issue as well as an exclusive online Q&A on the magazine's site. The band's name came from a nickname Yukimi earned in the recording studios. She would often become frustrated during recording which earned her the nickname "Little Dragon". And when the band decided on a name to go by, the nickname stuck.